‘Yay I’m so excited! Will I get to see the baby moving around?’ This was 9 y o’s reaction when I told him he had to be chief support crew for our embryo transfer this morning because The Vet was being chained to his clinic by a hectic back-to-back appointment schedule. ‘Well, no buddy, when the embryo goes in it isn’t a baby yet, it’s only slightly smaller than a pinhead so all you’ll see is a little white light.’ He bounces out of bed and gets dressed. ‘We need to take Lucky with us,’ he says grabbing a little soft toy bear sent to us by some very dear friends from home. ‘He’s going to be our lucky bear,’ he tucks him under his arm. I swig down the three glasses of water they make you have an hour before so your bladder swells up to an uncomfortable balloon-like shape and means they can see what they’re doing down there when little embie gets tunneled in. ‘I’m so excited when do we get to find out if we’ve got a baby?’ 9 y o asks in the waiting room. It’s clearly evident he has inherited his mother’s impatience for waiting any length of time whatsoever. For anything. Well, once it’s put in we have to wait for 11 more days until they take a blood test and tell us if it worked or not, I explain. ‘It’s going to work,’ he says triumphantly. God love his optimism, little champ. We get to the doctor’s office and unfortunately for both me and my bulging bladder they’re running half an hour behind schedule which means those three glasses I told you about earlier are about to erupt out of my bladder at any given moment like Mt Vesuvius. I smile sweetly at the nurse when she says she won’t make me laugh. Yeah, it’s not funny, love. AT ALL. We go into the doctor’s room and 9 y o takes the seat beside me while I climb up on the bed. He shakes the doctor’s hand like a grown up and sits down with Lucky in his hand. ‘This is our lucky bear,’ he tells the doctor. As the bed is lifted and the transfer begins 9 y o gently places Lucky on the pillow beside my head. 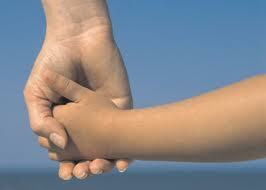 ‘Here mummy, hold my hand,’ he says gently. I look up at the nurse and she’s got tears in her eyes. The last time he did that was when our wedding cars never turned up to take us to the church. He wraps his little fingers tightly around my hand and watches intently, but silently as they implant our little embie. A few stray tears trickle down my cheeks and I feel his soft fingers wipe them away. ‘It’s okay mummy, you’re being so brave,’ he tells me. I think the nurse and I are both about to lose it. Even the doctor has to swallow. We’ve been through a whole lot, 9 y o and me. I’ve always known he was one helluva special little soul but it’s times like these that I’m reminded exactly how damn lucky I am to have him. We exit the clinic and to my great relief after a quick toilet stop, I’m able to actually talk without holding my breath. The kid tells me he can’t wait to meet our baby. ‘Can I come to the appointment when you get to find out?’ he asks. Sure I tell him. And may we be blessed with another one exactly like you. Only two-hundred and sixty-four hours to wait…and counting. That is the darn cutest thing I’ve ever read. And for someone who’s been spending a significant period of time reading pregnancy blogs that’s saying something. You’re lucky to have him. Good luck, I hope you can add another cutie to the mix soon!! !